Have you ever tried Kollam fish curry? If not, definitely you should try this at least once. 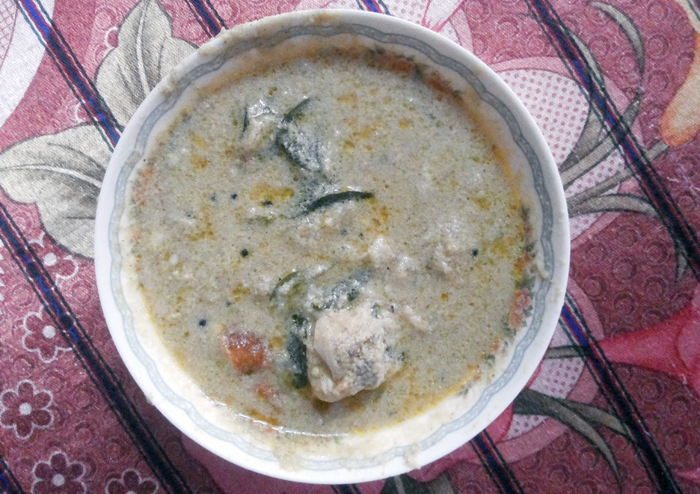 I love the fish curry prepared by mother for the breakfast dishes like Kerala Appam, Idiyappam, Pathiri etc. This is an entirely different preparation from the usual fish curries which we serve with lunch / rice. Clean and cut the fishes into small medium sized pieces. In an earthen pot, pour coconut oil and when it becomes hot splutter the mustard seeds. Add chopped ginger, garlic, green chillies and curry leaves and saute it. When the aroma goes add sliced onions and saute it till the onions becomes brown. Add the sliced tomato pieces and saute it. Grind grated coconut, turmeric powder, coriander powder, red chilly powder and shallot onion (Kochulli) along with one cup of water to a fine paste. Add the paste (#5) to the pot (#4). Add the fish pieces to the pot. Add water as needed, depending on the thickness of gravy you need. Cook till the fish becomes soft. Serve hot with Appam, Idiyappam, Pathiri etc. Red Snapper known as Pahari / Chemballi ( in Malayalam) , Sankara / Paruthi vela (in Tamil), Kora /thundava / rangu (in Telugu). Do you need more fish curry recipes? This entry was added on June 30th, 2013 by Renoos in Non Veg and tagged with kerala style fish curry with coconut milk, kerala fish curry with coconut paste, kerala fish curry with coconut milk, fish curry, fish, best fish curry recipe, malabar fish curry with coconut, tasty and best coconut fish curry, kerala fish curry. Last revised on April 4th, 2018. Will be trying the Kollam fish curry this weekend – i am sure we will be bringing in God’s own country in our kitchen. @Sridhar : Its my mom’s special. Try it and let me know your comments. Its best to serve with breakfast dishes. Hi Kitchen Doctor – kept this one dish pending for a long long time but tomorrow (Sunday) is the D Day for this (since its your mamas recipe – we are sure its going to be traditionally delicious) we are planning to have this for breakfast with hot dosa (straight from the pan to our plates). will by all means comment soon after. Thanks a lot Sridhar for the support and trying the recipes. Its of great value for us, since we are in the budding state. I am definitely sure, you all will love this recipe. After preparation, don’t forget to share the photo with me.